Essentially, Marketing is all about building reputation, awareness, image and changing perceptions, as well as driving traffic to your website and/or place of business. Once there, the traffic and potential customers/clients need to be converted, which is where your Sales conversion process kicks in. You can drive all the potential customers in the world (or even in your local area) to your website, shop or office, but if they don’t like what they see when they arrive, they won’t convert to become customers, or return to re-purchase. 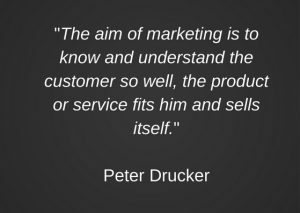 The Seven ‘P’s of Marketing‘ all have a part to play in ensuring that the marketing mix is relevant and satisfying to each customer. Conversion to a sale is the responsibility of Sales. If customers don’t like what they see on your website, can’t find what they came for, if your pricing is not acceptable, your product is of the wrong quality, your online or offline displays are unappealing, your promotions are ineffective, your customer service or delivery process is unacceptable, or there is no physical evidence to support what your are offering, then your customers will probably decide not to purchase goods or services from you. But these ‘7 Ps’ are generally factors within your control as a business, and you have a responsibility to stay on top of them at all times. The ability of employees to deliver service excellence is often a key factor, as are user experiences on websites. Sometimes, you have managed to tick all these boxes and to convert a lead to a customer, but the after sales service (where it can exist) can still result in a negative experience. This results in a failure to re-purchase or to recommend to others, and this is why customer care, a joint responsibility of both Marketing and Sales, from pre-sales to post-sales, is so important. Often, a negative customer experience can be turned around by handling such feedback in a positive way, leaving the customer pleasantly surprised and even delighted with the outcome. With the differences between Marketing and Sales in mind, it is vital to identify the points along the customer journey where you are able to influence the experience in a positive way, and to act upon any factor which may be letting the side down. Contact us if you would like any help with elements of your marketing mix, sales process or customer relationship management. We deliver support and work with trusted partners in these areas to ensure our clients’ businesses are operating as effectively as possible.